A lot of clients have pets or children - or both. Sometimes testing out area rugs samples is needed. Sisal, seagrass and jute. As you can see, Wallace is very helpful. I love this antique inlaid Syrian piece with the mother of pearl detail. It works perfectly in a client’s foyer. We recently worked on a wonderful Victorian house with great detailing. We darkened the floors and railing and added a natural fiber seagrass up the stairs. The paint is Farrow & Ball Paint No.247 Terre D'Egypte - a deliciously warm red-brown terracotta. I have dear friends in New York that have had the Dansk Kobenstyle cookware in bright red. I have always loved the design and am thrilled Dansk has re-issued it. Now in white and black. I couldn't decide on which color, so I ended up ordering white. I love that the lid can be used as a trivet. 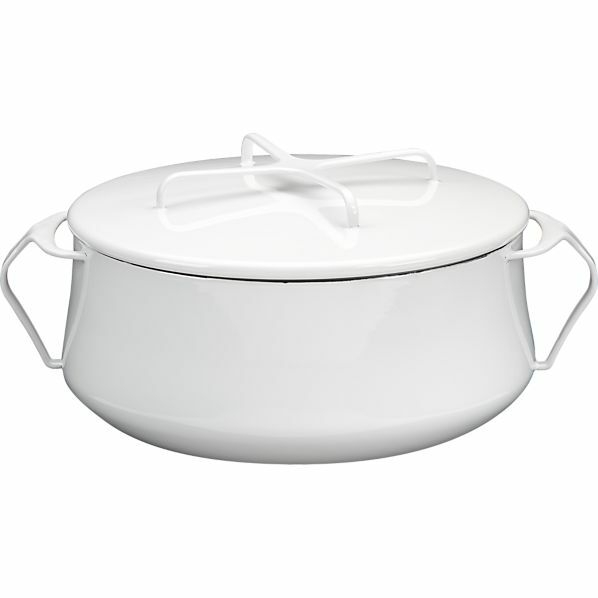 I Love the Dansk Kobenstyle cookware from Crate&Barrel! I just picked up some pieces for a client's cottage. Great Design! Oooh! Love that mother of pearl chest. Gorgeous! How does seagrass hold-up for the long haul? I worry it would only last a couple of years in a busy house. I LOVE the mix of color in the victorian staircase! So welcoming! I love the color combination in the victorian staircase. So welcoming! For the questions on natural fiber rugs. They hold up very well. I have them in my own apartment and they still look new. Vacuum weekly- etc. I highly suggest them for any space! Wonderful post of new ideas...love it. The mother of pearl chest is breathtaking! That mother of pearl desk is breathtaking!